The chapter is ruthless, full of broken teeth, mangled bodies, bitterness and mockery. And it is God who inflicts all this on Jeremiah. When did you last hear that God has “made me walk in darkness rather than light”? It doesn’t sound right, as though all the meanings are inverted. It’s as if someone set out to write the opposite of “the Lord is my shepherd”. Now this is hardly a reassuring message at first glance. It’s as if he’s saying “God beat me to a bloody pulp, but at least he didn’t kill me!” But to me it has a different significance. To me it says that God is in control of everything, and even in the darkest moments of suffering and despair, God is still in control. This isn’t meant to be soothing or inspirational – it’s radical and transformative. We think we are in control, and that God is this thing or this guy who wants to help us, and if we’re really good or really repentant or practice talking to him often enough then things will start to go our way. And if things don’t go our way, it’s just because we haven’t tried hard enough, or we don’t really believe, or we’re being tested, or we’re not truly penitent. What’s really going on is that God is in control. Not just in some abstract or distant way, but deeper than our own sense of pride and agency would have us know. “Without Me you can do nothing,” and that’s putting it mildly. God moves man to act, not only by proposing the appetible to the senses, or by effecting a change in his body, but also by moving the will itself; because every movement either of the will or of nature, proceeds from God as the First Mover. And just as it is not incompatible with nature that the natural movement be from God as the First Mover, inasmuch as nature is an instrument of God moving it: so it is not contrary to the essence of a voluntary act, that it proceed from God, inasmuch as the will is moved by God. To say that you have free will does not mean you are like God. You are not able to control yourself, secure your own salvation, or even practice virtue independent of God’s will. Any movement of your will is dependent on God’s will. The impression that you are thinking and acting and willing independent of God’s will is the illusion we call ‘Pride’. The impression that the buck stops with you is false, and both the cause and symptom of sin and suffering. God is in control, absolutely. What makes Lamentations 3 so striking is that Jeremiah recognises God’s control, and ascribes to God responsibility for his suffering. He doesn’t succumb to the illusion that God is not in control. This is radical, but it is also very mysterious. It means that in our sin and ignorance, in the midst of this illusion of self-sufficiency and control, God is nonetheless still in control. So why do we suffer? Why undergo this whole bewildering drama and illusion if God could stop it right away? Better to reign in hell? Taken literally it illustrates the devil’s pride and bitterness at having been cast down from Heaven. He would rather reign in hell than serve in heaven. We’re not so different. Even when it makes us miserable we prefer to be in control, to feel responsible for our own suffering. At some point in our early lives we encounter circumstances of life that conflict with our desires. For some people it comes in the context of terrible abuse or trauma, while for others it comes in “normal” aspects of life like having to move away from friends and relatives, or everyday battles of will with parents and authority figures. The key point is that we find ourselves conscious of having desires – a will – that conflicts with external reality. Our desires and the external world are both equally real. But for some reason at the point of conflict between the two, our perspective changes and we begin to feel responsible for one aspect of reality – our desires or will – and not for the reality of the external world. On one level it seems obvious that in a conflict between our internal desires and the external world we should be responsible for the part that exists inside our own head. But we don’t create our desires, nor do we choose them. We are not responsible for them in the sense of being their author. So why do we feel responsible? We may feel we are in control of our own will, but this just begs the question. Our sense of responsibility flows into other psychological states. We find ourselves trying to reject unsavory aspects of external reality. We seek to compensate for our unfulfilled desires. We sulk. We get angry at the world for failing us, and at ourselves for failing to get on in the world. Above all, we feel that the conflict is ultimately our fault. Not that we necessarily caused the conditions of the world that so disappoint us, but that it seems we ought to have within ourselves the power to overcome or resolve this conflict. So we feel, and so we are often told by others, especially by parents and authority figures who would simply (and understandably) prefer that we not protest or complain. We believe it is our fault, our failing, to have desired something we cannot control. We believe that our desires are, or should be, within our control. Alternatively, we believe it is our own fault that our desires lack efficacy in the external world. This belief in our own failing burdens us with a sense of responsibility, faulty responsibility for our own unhappiness and dissatisfaction in life. Thus we reign in hell. The paradox is that the worst of the suffering comes from thinking that we are responsible, that it is somehow up to us to correct our faults, to achieve righteousness, to make ourselves right again through our own efforts. That’s what reigning in hell means, I think. In the moment of conflict between our desires and the external world, we take command, responsibility, and therefore blame for the whole conflict. At the same time we fear to surrender this responsibility and illusion of control because it keeps alive in us the hope of repairing the situation. We own our fault, in the hope that we may repair it. That’s why, like Milton’s devil, we prefer to reign in hell. Our reign is hell, you might say, because it is a delusion, it doesn’t exist, we are not in control and we are not responsible. But admitting we are not in control is too frightening. It would feel like dying, the death of the illusory self who rules over our faulty existence. It would mean accepting our reality totally, both the external world and the desires and will that conflicted with it in the first place. A friend pointed out to me that I always have an objective. I’m always trying to accomplish something, reach a goal, or at least form one. The idea of surrender and “letting go” is ubiquitous in self-help and religious literature. Unfortunately for someone like me, it’s easy to turn “letting go” into an aim or objective, yet another form to cling to. I used to tie myself in knots around the paradox of seeking to be selfless for selfish reasons. This appears in a lot of popular Zen material as the problem of desiring to be without desire or the ego that seeks to be free from itself. It’s been X all along, but like a person with amnesia, this new memory will not last for long. Even if I remember the conclusion, I’ll forget its true significance. I’ll remember what but not how. And before I know it, I’ll be back striving for some ill-defined goal. Ultimately, goal-seeking is about feeling in control, and with that realisation I’m immediately tempted to dig at the roots of this love of control and see if I can’t put an end to it. But that would be another objective, and I’d disappear once again down the rabbit-hole. So, appropriately, this post has no conclusion, no recommendation, no suggestion of how to solve the problem and, perhaps, no temptation to form another goal. thee, but thy own judgement about it. thee from correcting thy opinion? Being a parent can be incredibly difficult, and I’m in awe of those who make it look easy. For the rest of us it’s important never to forget that we are doing something wonderful and difficult. Forget that it’s difficult, and we’ll be crushed under the burden of our own expectations. Forget that it’s wonderful, and all the talk of difficulties will scare people away from the genuine goodness and fulfillment of raising a child. It doesn’t always feel wonderful, especially in those moments when fatigued parent meets manic child and the two do not mix. Did I say moments? It’s typically hours, and in those hours the most important thing (after your child’s safety) is your own mental health. When your 18 month old son has decided that the best thing in the whole world is to climb onto the arm of the couch and launch himself backwards, landing flat on his back on the cushioned seat like he’s auditioning for a circus, there’s not a lot you can do. 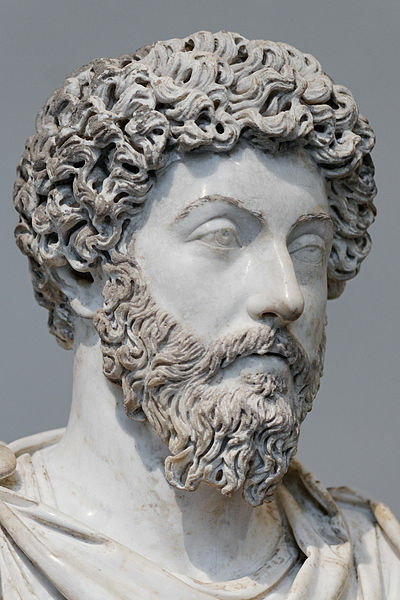 Eventually my Stoic influence kicks in, and I realise à la Marcus Aurelius that the problem is not so much what he’s doing, but what I’m doing. I have in my head an ideal of how my son should behave, and though my fatigue is real it is made a hundred times worse by feeling frustrated as well. I’m frustrated that he is doing something potentially dangerous. I’m frustrated that he won’t listen to me and behave himself. And I’m frustrated that I can’t think of a way to make the environment ‘safe’ without putting a childproof fence around everything. In other words, I’m frustrated at my lack of control. To be completely honest, this is my problem not my son’s. He’s quite happy, in fact he’s ludicrously happy, and if I were a child again I would be doing exactly the same things and making my parents equally frustrated. After all, what is the use of having some ideal of how my child should behave if that ideal does not include him being ludicrously happy? Would it really be better for him to sit and play with my smartphone instead of exploring and enjoying his environment out of his own initiative? In practical terms, all that really matters is that he is safe. And with that in mind all I really have to do is sit close by and catch him if he falls or pull him back if he tries to do something truly stupid. I might still be fatigued, but at least I’m no longer frustrated, and I’ve reduced the burden of my expectations down to simply being there. Just being there doesn’t feel like enough. It feels like I’m neglecting him. But I’m beginning to think it’s much more valuable than trying to coerce, control, intervene constantly, and even interact constantly, as though he will turn out wrong if I don’t feed him with a steady stream of encouragement and chatter. Simply being there to keep him out of serious danger may be the least I can do; but sometimes the least is all we can reasonably manage, all we need to do, and therefore the right thing to do.